A speaker designer must optimize all parameters in balance with the woofers. One of most important factor is the linear excursion, or the Xmax parameter, of the bass driver. This is commonly expressed in millimeters (mm) of excursion, representing a driver‘s allowable piston travel distance to the cone before it gets into non-linear (distorted) operation. This figure also directly reflects the maximum undistorted Sound Pressure Level output to a woofer. Many woofers are described as “long-throw” without specifying Xmax to the audiophile. This can only reflect one fact, that being that the cone has a longer travel range with a better suspension system and may sometime incorporate higher handling power capacity. This does not mean that this driver has maintained low distortion or accuracy during large cone movements. While dynamic current forces the cone piston to exceed its linear range into non-linearity, the SPL output can no longer respond in proportion, resulting in severe, unbearable audio distortion. The so called “long-throw” woofers are normally validated for the sub-woofer applications since human ears are not so sensitive to deep bass, certain degree of distortion may be acceptable yet we can not consider them the true hi-fi. 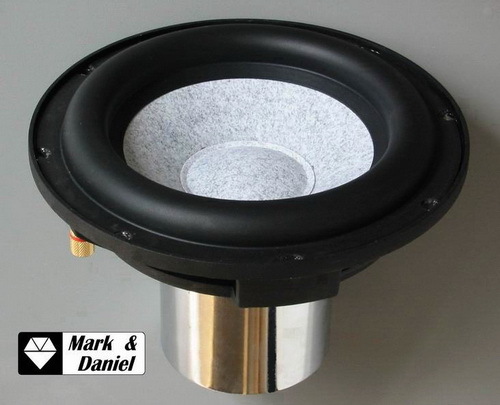 For a conventional woofer to be good quality, it normally has an Xmax within ± 3.0 to 4.5mm for a 5” or 6.5“driver. We can rarely find an 8” or 10“ driver that has an Xmax exceeding ±7.0mm, except for a few expensive drivers specially designed for sub-woofer applications. Modern digitized recording requires an additional 10 to 20dB in music dynamics. This forces the bass driver to exceed its excursion limit more often. It is rather difficult to further increase the gain of the Xmax through conventional design. There is not only the cost concern of using larger magnets but one must also consider the many trade-offs affecting other parameters of performance at the same time. The alternative is to employ more woofers in parallel to get higher SPL output just like many floor-standing systems do today. Yet, unless the speaker enclosure is enormously large, this solution will sacrifice the deep low-end bass for a higher F3; that’s why the sub-woofer is always needed for the 5.1 sound system. However，M&D prefers to create his own full-band, true hi-fi speakers without necessarily needing the assistance of sub-woofer!